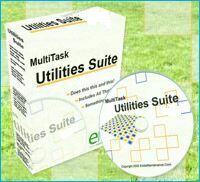 EddieMaintenance.Com and the MultiTask Utilities Suite CD was created by the owners of a highly successful PC Sales and Service company that's been in business since 1994. Our Suite of 68 Utilities is the most useful and powerful CD you will own. It will save you hundreds of dollars in repair and service costs by providing you with the directions and tools you need to fix your PC yourself. It includes the exact same tools PC technicians use to fix computers but with the advantage of including easy to follow directions written for beginners so anybody can follow them and be successful. The most important feature about this Suite/CD is that it will NOT install ANYTHING without your permission. It is 100% independent and will NOT write ANYTHING to your hard drive unless you want to install and/or use an app. included on it. In fact, even while booting with it, not a single bit will be written to your hard disk. Yes, this CD is BOOTABLE. You can use it to easily install any version of Windows, Tune and Clean Up your system, Undelete files, Remove old Windows installs and partition and format, Clone Windows from your old hard drive to new drives, Diagnose hardware, and much, much more. Click here for some SCREENSHOTS.